Sharks are one of the most successful groups of organisms to have ever lived on this planet. Primitive sharks first appeared over 400 million years ago and have been evolving ever since. The proliferation of sharks during the Paleozoic Era probably resulted in the decline of other previously successful organisms, such as trilobites. Some ancient types of sharks took bizarre forms - others looked very similar to modern-day species. Sharks have a skeleton composed of cartilage and possess open gill slits. Most are predators with well-developed teeth and are protected by bony scales. Most sharks have dozens or hundreds of teeth in its jaws at one time. As these teeth were lost in feeding or battle, new teeth quickly moved in to take their place. Complete fossil sharks are extremely rare because of the absence of bones. Usually, only the teeth are preserved. The most difficult part of classifying fossil shark material is dealing with the variation in form that occurs within each individual species. For example, teeth from the same shark may exhibit a wide variety of forms depending on what part of the mouth the tooth is from. Some recently extinct sharks, such as Carcharocles, reached enormous size, while some truly ancient types could fit in the palm of your hand. 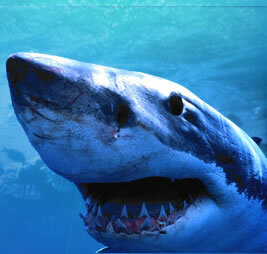 Today, Carcharodon carcharias, the famous Great White shark, can reach 30 to 40 feet in length. This "Man-eater" has teeth that grow up to 3 inches long and instills fear in all who cross its path. The movie "Jaws" made us all familiar with the Great White - we are still deciding whether or not it is "safe to go back in the water". Great White sharks usually prey on any slow or injured sea creatures. They are mostly found near the Great Barrier Reef off the coast of Australia, but they range across the world's warm oceans. Great White teeth have been found as fossils, but only in the most recent deposits. Mako Sharks (Isurus), related to Great Whites, are active and aggressive predators. They have teeth virtually identical to Great Whites, except for the absence of coarse serrations on the cutting edges of the tooth. The dentition of Mako sharks may have two different forms. The narrow-toothed varieties have slender, anterior grasping teeth and more blade-like, lateral cutting teeth. The broad-toothed species have dentition composed entirely of cutting teeth. Fossilized Mako teeth have been found dating back tens of millions of years. Hammerhead Sharks are quite strange-looking. They have a very distinctive head that may have several different functions, including a bowplane for hydrodynamic lift, an enlarged sensory field for detecting prey, or a separation of eyes and nostrils for more precise location of prey. Hammerhead Sharks are usually found in coastal waters. Their diet consists of rays, smaller sharks, and bony fishes. The upper teeth are used for cutting, while the lower teeth are used for grasping. Other present-day sharks include the Megamouth Shark, Tiger Shark, Whitetip Shark, Bull Shark, Whale Shark, Lemon Shark, and Blue Shark. The largest fossil shark ever found is the extinct Giant White shark, Carcharocles megalodon. Adult specimens of this extinct shark reached 50 or 60 feet in length, the size of a Greyhound bus. They had teeth that were up to 8 inches long, set in thick jaws that were 6 feet or more wide. These "Megs" were virtual killing machines, and were among the fiercest predators ever to inhabit the Earth. Their fossilized teeth, especially large, well-preserved examples, are some of the most collectible shark fossils in the world. Mackeral Sharks have one living genus, but are mostly known as extinct species. They have teeth with pronounced lateral cusplets. Anterior teeth have erect crowns with a deeply-notched basal root margin. The lateral and posterior teeth become progressively more oblique in form with broader and more massive roots. Otodus obliquus is a very well-known type of extinct Mackerel Shark. Cow sharks remains are also found throughout the fossil record. 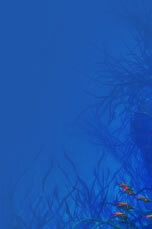 They were primarily deep water inhabitants, although their fossils are occasionally found in shallow water deposits. They had six to eight gill slits - most shark species only have five. There also seems to have been sexual dimorphism in the teeth of Cow sharks - the exact shapes of the teeth seem to differ from the males to the females. An extinct Cow shark whose remains are widely-distributed is the Six Gilled shark, Hexanchus. Other types of extinct sharks whose fossilized teeth have been discovered include Paleocarcharodon, Odontaspis, Squalicorax, Hemipristus, and Galeocerdo. Man has always been fascinated by sharks because of their swift, graceful nature and their predatory success. Sharks are easily the most feared animal in the sea, and possibly the entire planet. Shark body parts, especially the fins and tails, are used by some cultures as food and even aphrodisiacs. Is it any wonder that fossil collectors and curiosity seekers alike are enthralled by these mysterious murderers? Distinguishable remains of fossil sharks are highly collectible - large shark teeth, like those of Carcharocles megalodon, are extremely sought-after in all parts of the world.